Configuration: The most important part is Configuration. You can add network devices like Switches, Routers and Servers, here. Monitoring: When you add Devices like Routers, Switches and Servers which are called Host, you can use Monitoring menu to see the results of monitoring. For example you can see the graphs here. Reports: After a while, you may need to have a report about for example bandwidth usage. You can use this menu for creating reports. Administration: You can add Username, change password, change User’s profile, add new Media Type (Like SMS and Email), create Script, etc. IP Address: 192.168.1.201, I recommend to use IP address rather than DNS Name because if you use DNS Name: You have to have DNS Server which works properly. Type: Means how you want to monitor your data? Zabbix Agent, SNMP v2, SNMP v3, etc. Key: Choose an unique name for your Item. I recommend use similar things for Name and Key but you have to obey the conditions. For example, for CPU Usage, I choose CpuUsage and for CPU Idle I choose CPUIdle and so on. It means the total number of Uploaded Bytes, including frame, in FastEthernet (10/100). In the Graph part, you can create a new Graph for each items you have created before. Trigger means: Please watch the data which are storing and evaluate it by something which I tell you. By the way, I never check the email cbt4allemail@gmail.com! It is only for my lab. Now we can monitor Items each device, one by one. But do all devices have limited Items? For example if we want to monitor a Switch with 48 ports, do we have to add all 48 interfaces one-by-one? In next video I will show you how you can use the Templates to make monitoring easy! Thanks for your email. Actually I don't get your problem. What do you mean exactly?? If you have connectivity to your remote sites, you can monitor your site easily. What is the problem? This is video very helpful! But in step send mail with postfix, i can't send mail! In don't know what wrong! 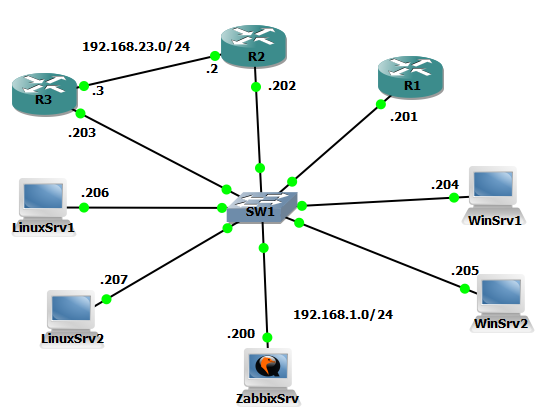 Can you please help me out for the SNMPV3 configuration in Zabbix 2.4 on Centos plate from. How to change the severity of an issue from High to Not classified. Thanks for your comment. Happy you like the videos. I am having an issue with my Zabbix Dashboard. I get the message at the bottom of the page "Zabbix server is not running: the information displayed may not be current." Also at the top it says Zabbix server is running and the value is No in red font? wrong answer on MAIL FROM "530 5.7.0 Must issue a STARTTLS command first. 5sm6593027vkc.13 - gsmtp"
I hope you can help me with this one. Hi, well if you followed my videos you would not get the error. But it seems you need to run the ZabbixServer manually. I am new in Zabbix ,my teammate that was configured zabbix has left now .My question is how can i remove Yahoo alert from zabbix .Actually Yahoo site is working ,but why it is sending such alert Yahoo is not working,let me know. After following your instructions step by step, I have reached the using GNS3 to emulate, I have not worked with the GNS3 before, could you help me to configure the GNS3 in order to play exactly the same as the step in your video. Thank you in advance and hope to get you reply as soon as possible. Thanks for all the content on zabbix. I have a question concerning Zabbix agent. Is it possible to not use jmx gateway and instead use Zabbix agent to transfer java application metrics to the zabbix server? I have a juniper srx340 device, I monitor it with snmpv2 ok and monitor the dc interface with temp discovery, CPU and memory I can not get. I tried OID and MIB but not exactly. Could you please guide with juniper equipment.